Please complete and return to TR Cleaning Limited. Using reverse osmosis and deionisation technology tap water is purified removing all traces of dissolved minerals and impurities. This water is transported in large vehicle mounted tanks and then pumped up telescopic poles with brush heads at the end. Dirt is scrubbed from your frames, glass and sills, then the window is rinsed and left to dry naturally. As the water is pure it dries without leaving any marks. Plastic roof panels 1-2 cleans a year. Glass roof panel 2-4 cleans a year. 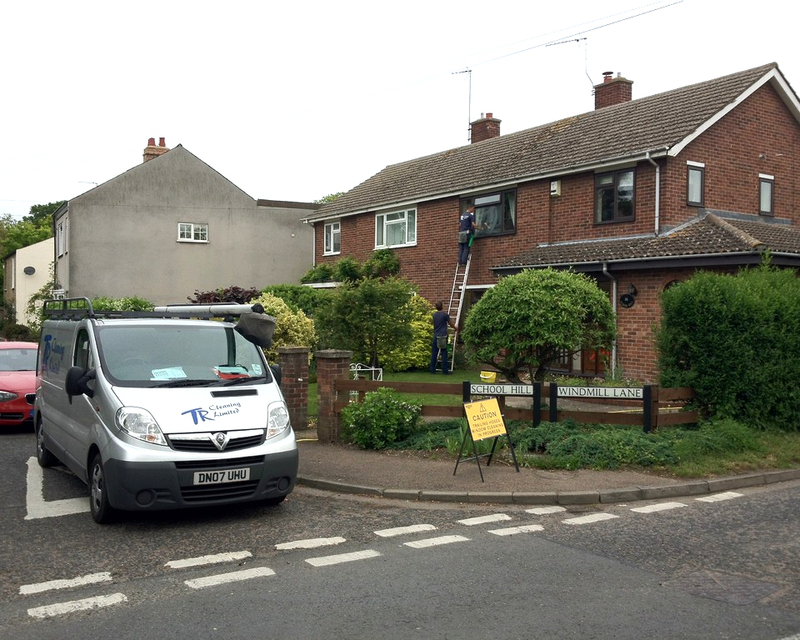 No need to place ladders on your fascia or guttering, which may cause damage. No mess to clear up at the end. We bring our own power supply. Very competitive prices due to being faster than using a ladder (see price list). Driveways, block paving, patios, walls, decking all become dirty with time. TR Cleaning Limited provide a comprehensive pressure washing service utilising commercial pressure washing equipment and techniques to remove the dirt and grime from your surfaces. Ask our staff about our annual pressure washing round. All prices listed in the above table are a guide price and may vary once on site, this maybe due to access, window construction or other factors. All prices listed in the above table are a guide price and may vary once on site, this maybe due to access, building construction or other factors. We No longer offer internal window cleaning. 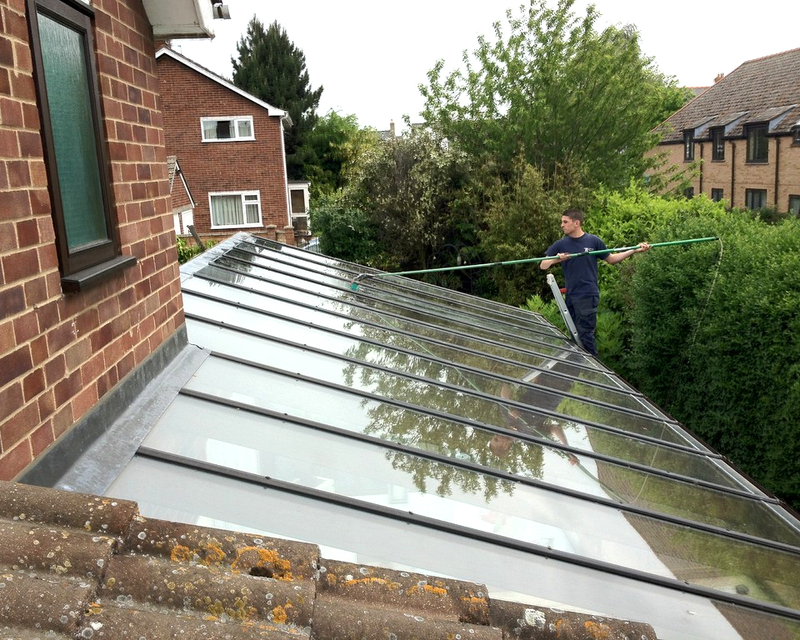 We No longer carry out domestic window cleaning in Cambridge City Center unless the property has access readily available and guaranateed parking either onsite or directly outside the property. (We regret changes to our service but parking restrictions and access issues mean it is not financialy viable to conduct this service at a competetive rate). 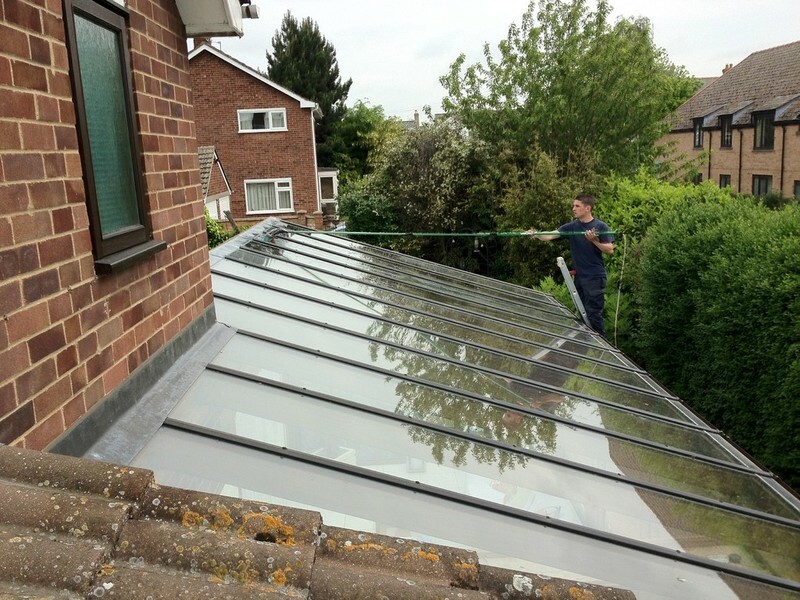 We offer a professional and reliable domestic window cleaning in Cambridge and surrounding villages. For regular domestic window cleaning we operate a maximum working radius of 20miles from our office post code (CB23 8AT). You can pay our window cleaners after they have carried out the cleaning service via cheque or alternatively transfer the fund using internet banking making sure to put the first line of your address as a reference so we can cross reference the payment with your account. If you are not in when we carry out the cleaning we will leave an invoice with our payment details. Please note our window cleaners do NOT accept CASH. We offer the choice of 6 Weekly or 12 Weekly cleaning schedules. We ask for some flexibility on time scales due to rain and other factors of a 1-2 weeks either side of the time due. 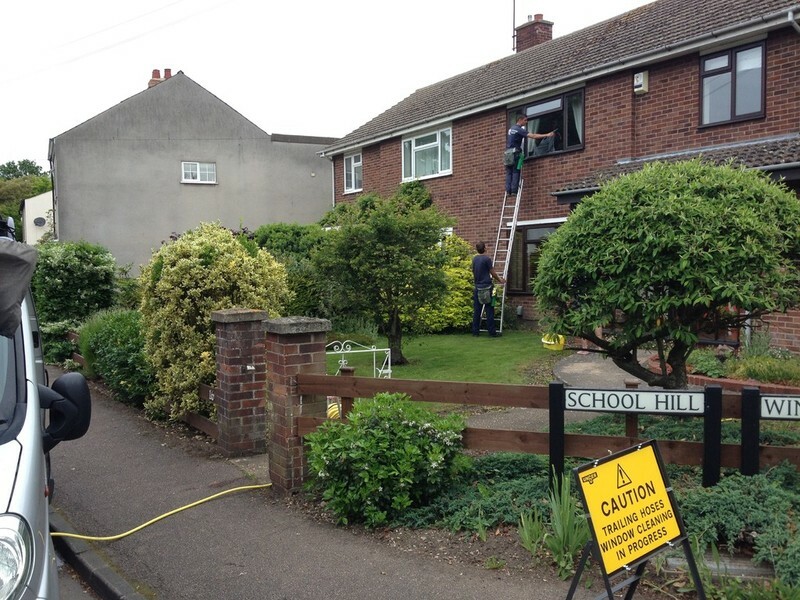 We carry out domestic window cleaning from Mon-Fri 0730hrs-1700hrs and Sat 0800hrs-1400hrs. Due to the sheer volume of both commercial/domestic work, unpredictable British weather and traffic we cannot provide specific times that we will be on site. Rest assured you do not have to be at home for us to carry out window cleaning activities, once the work has been completed we will post and invoice through your door. Due to the sheer volume of work and unpredictability of the British weather, it is not viable for us to contact every customer before we come to clean your windows. Therfore we cannot arrange apointments for window cleaning and will just turn up and complete the work during our work times see item 1.2. We will of course knock on the door or make ourselves known before we carry out window cleaning on your property (after 9am before this time we will just proceed in case someone in the family is still in bed). As you can imagine the majority of our domestic window cleaning customers our out on the day of clean. 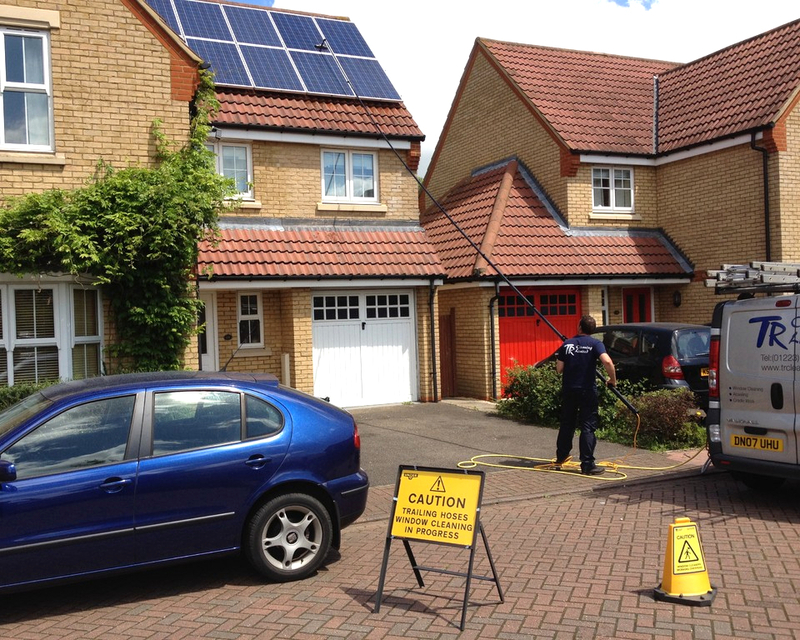 Therefore, it is common practice for our staff to access the rear of any property via ladder. If you have a gate with a combination lock, key safe or keep a gate key in a safe place you can let our staff know and we can add this to our secure database. If the property is only accessible via a garage then you will have to purchase and install a key safe and provide us with the code if you wish for us to clean the rear of your property. Rest assured all our staff wear Hi-Visibility uniform and our vans are sign-written and carry our company name and contact number. Any prices quoted are to clean all accessible windows via water-fed pole working from the ground. 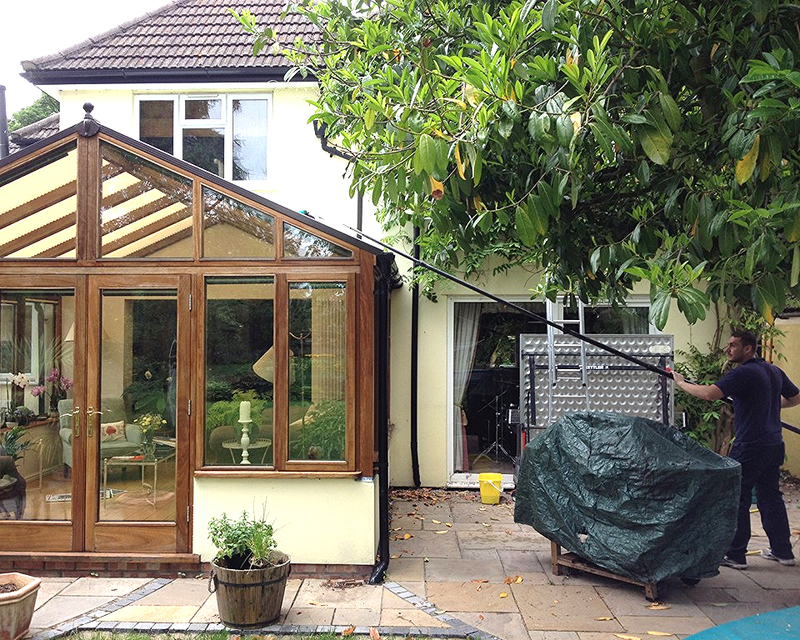 We will always try to not clean your windows in the rain, however we do still work in all weathers. Our promise to you is that the results will still be the same. We will try to be as reliable as we can for you, but we also appreciate the customer being reliable. We will make time and space in our schedule available for you. On the day of the clean it is too late for us to replace your clean with another. We reserve the right if turning our team away at the door or cancelling on the day with our office, to charge you the full price expected and/or cancel any ongoing service with us. If for one reason or another you should wish to cancel our services you have the right to do so at any time. This can be done by telephone on 01223 520092 or by email to domestic@trcleaning.co.uk However we do not offer one off window cleans and because of this a cancellation a charge of £30.00 will be payable if cancelled before a second clean has taken place. We will always try to provide you with the best possible service every time we clean your windows. If for any reason, you are not satisfied with our work, you must contact us within 24 hours of the clean. We will then return as soon as possible to re clean your windows for free. Please note that complaints made after 24 hours may not be re cleaned. All customer information is kept on a confidential database and is not discussed or shared with any individual or company, as is required under the terms and conditions of the data protection act. 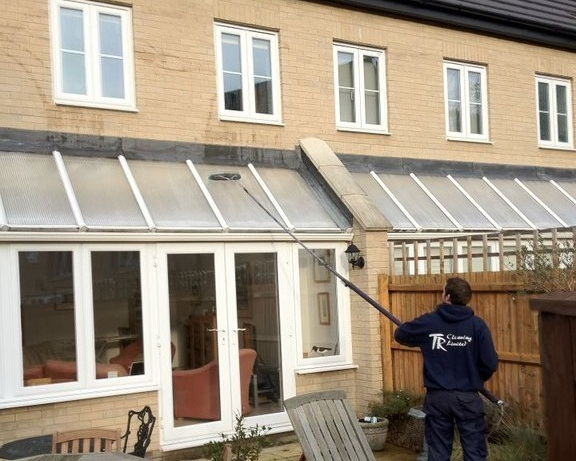 We will be using the reach and wash system provided by Ionic Systems Ltd to access and clean all your windows. This method uses only purified tap water and no chemicals or detergents making it 100% safe for people, plants, pet’s, children and the environment it is used in. The water is purified at our base and transported with us in our vans. We will arrive with all the equipment we need to carry out this work. Our purified water is pumped from the van along hose lines and up telescopic poles, which we use to scrub dirt from your frames, sills and glass. All we ask is that access around your property is available and that all your windows and doors are closed. Once cleaned, surfaces are left to dry naturally as is normal in this method, because the water is so pure it dries leaving no marks at all. We can clean to a height of 4-5 stories or 60ft. We are only able to clean along a clear line of sight, some angles or high recessed surfaces my not be possible to clean. 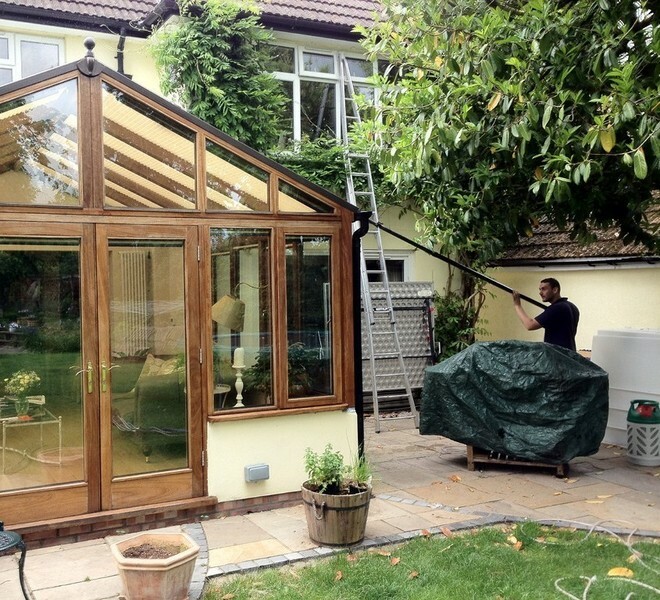 We also use this method to clean conservatory roofs and fascia and soffits. Sometimes, it is still appropriate to use traditional methods in modern day window cleaning. If insides are required, we use squeegee and soapy water to clean. If we do clean your windows inside, we require you to clear windowsills and obstructive furniture so we can continue with our work efficiently and safely. 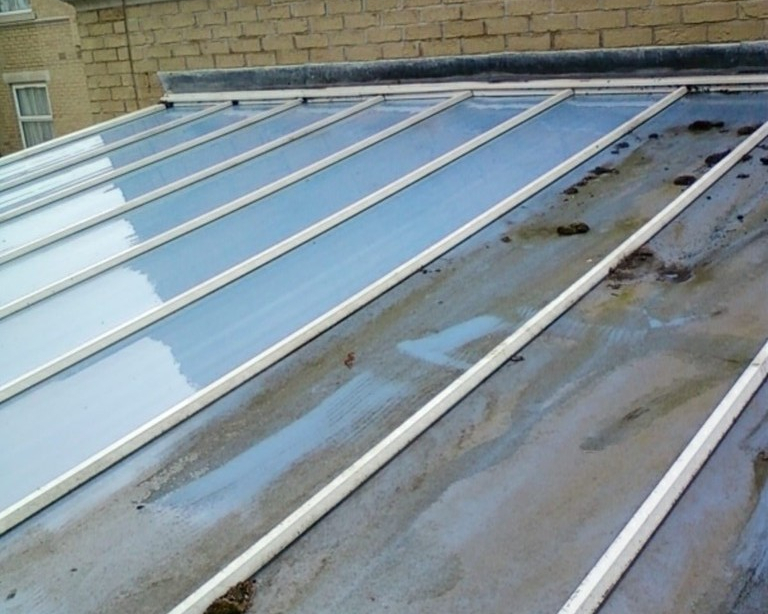 Sometimes, we need to access low-level flat roofs to carry out work. We will use a ladder to gain this access. 2.3 Gutter Clearing with industrial Vacuum. By using a vacuum, we can clear your gutters from the ground and reach difficult angles and heights that a ladder cannot. We will use a powerful wet and dry vacuum, which reaches, from the ground up and into your gutting to a maximum height of 40 feet. All the waste is sucked out of the gutters and into the machine just like when you vacuum your carpets. When we have finished, the waste is taken away with us. Although the machine is powered electrically we will bring our own generator. Our company and public liability insurance is a comprehensive specialist window cleaning insurance and our policy details can be found on this website under 'About Us' page.